With this initiative some consider it will lead to demand increase, reduction in the price of solar panels due to volume efficiency, with electricity structure shifting mainly to renewable energy, arousal of demand which will stimulate economy, creation of energy related employment (green jobs), and that it can create a society free of nuclear power plants. This initiative is seen as a way to increase demand for solar panels due to price reduction and volume efficiency, thus shifting the electricity structure towards renewable energy, at the same time stimulating the economy and created energy-related employment (green jobs), contributing to the potential for a society free from nuclear power plants. In Germany where FIT has been introduced, however, efficacy of green jobs is questionable. Further, the Green Jobs Program in the US has hardly created employment. We would like to introduce this fact. Industry cannot be created only with subsidies. We would like to point out that industry cannot be created with subsidies alone. Government of Germany indicated that 370,000 jobs related to renewable energy were created by 2010. Further, Germany has the highest solar cell installation rate, and its cumulative amount was a little under 25 million kW by the end of 2010. Last year only, 7.5 million kW worth has been installed. However, this achievement is established with hidden charge in the electricity bills. The amount paid towards FIT in a year was 13.6 billion Euros (17.6 billion USD) in 2010 alone, 10.3 Euro (13.4 billion USD) per month per household, which is 15% of electricity charges. It is said that half of this paid amount is for solar cell purchases. If also considering the negative effects of economic load of FIT towards other industries, it will drastically cancel out the employment increase. In the 2007 report by BMU (Federal Ministry for the Environment, Nature Conservation and Nuclear Safety) in Germany, it created a little under 240,000 jobs in 2006, however, considering its economical effects even BMU's estimate decreases to around 70,000. The Spiegel, a German weekly magazine, on January 18th, reported a news article “Re-Evaluating Germany's Blind Faith in the Sun- Solar Subsidy Sinkhole ", that criticisms are increasing toward subsidizing policy for solar electricity, and government is considering its review. Currently, solar cells are relatively more expensive than existing energy sources, therefore, if they are introduced in large quantities, it will increase the national burden. If a large profit that exceeds the burden can be gained, it will give a positive effect to nation's economy and employment. Developed countries, however, have not gained profit. Let's take a look at present export situation. Trade specialization index is used in order to see export competitiveness of solar cells in key countries (Figure). This index shows ratio of net export, which is export amount minus import amount, to total trade. If it is close to 1, it can be judged that export specialization is higher, thus higher export competitiveness, and when it is close to minus 1, import specialization is higher thus lower export competitiveness. Figure: Trade specialization index of solar cells in key countries (1988 – 2010), created by the editorial from UN Statistics. 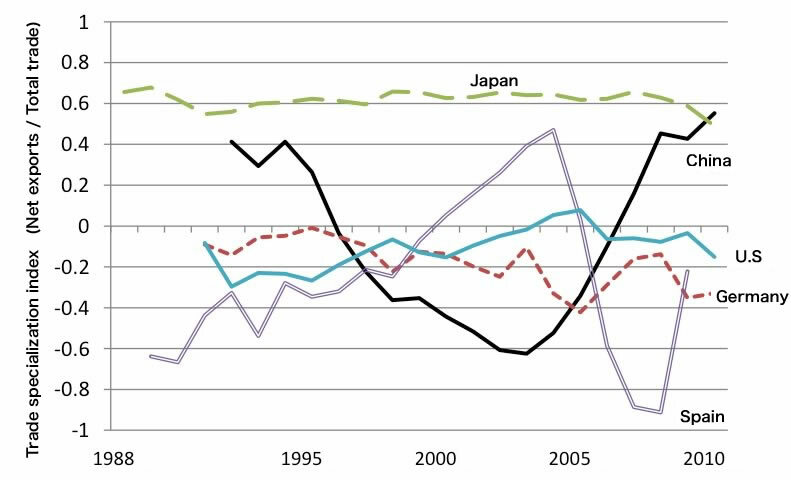 Looking at this result, trade specialization index of Japan was around 0.6 throughout and remained approximately consistent, however, in recent years, it is showing a tendency towards less export competitiveness. This is because the price of solar cells is rapidly going down, and Japanese makers are losing price competitiveness and significantly losing export profit. The amount of export of solar cells from Japan was a record high for two years in a row in 2009 and 2010, however, export value of shipment was 220 to 260 billion yen (2.75 to 3.25 billion USD), for the same years, which is 100 to 150 billion yen (1.25 to 1.87 billion USD) less than the 370 billion yen (4.8 billion USD) of 2008. Secondly, while Germany is minus throughout (i.e. import specialization), since 2003 China has been rapidly increasing export competitiveness. In 2010, it had greater export competitiveness than Japan. This indicates that a production system of solar cells within China is rapidly improving. Likewise, Spain is specializing in import. Germany and Spain both introduced FIT. In Germany and Spain, mass introduction of solar cells into the domestic market did not enhance export competitiveness of domestic manufacturers. It gave entry opportunities to overseas manufacturers such as China, and resulted in helping them catch up. It is desirable that this should bring the price of solar cells down. On the other hand, however, a dip in unit price of the product means less export profit, therefore it is not a plus factor for export industry. This indicates that achieving two objectives of promoting export and creating green jobs at the same time is difficult. One of political slogans of President Obama, inaugurated in 2009, was to create 5 million jobs related to green energy in next 10 years. At this point, there has been increasing criticism that it has hardly created domestic jobs in reality. Bankruptcy of solar cells venture company Solyndra (in 2009, government gave loan guarantee of 530 million dollars, but most of it is irrecoverable) was widely reported also in Japan. Around the same time, last September, Office of Inspector General, Department of Labor, released an evaluation report on Green Jobs Program by its Employment and Training Administration. In his State of Union Address of January 2012, President Obama appealed for the expansion of renewable energy, however, many difficulties can be foreseen in the future. What do these results suggest? Whatever way it is generated, there is no difference in the electricity consumer gets. When changing the supply from existing power sources to renewable energy, if we use higher cost power sources, it will lead to increased burden on the entire economy. We should not expect too much from FIT, but we are required to make a reasonable judgment based on the experiences of Europe and America and serious economic and financial situation of Japan. THE GREEN ENERGY DEBACLE: WHERE HAS ALL THE TAXPAYER MONEY GONE?